Victoria Beckham is rocking the fuchsia satin pumps with one of her namesake designs. Beyonce's blue suede pumps pop against her flirty mini....correction, her almost too short mini! Selita Ebanks whips out the snake skin pumps for a charity event. I love how they complement her sleek sheath dress and add interest. 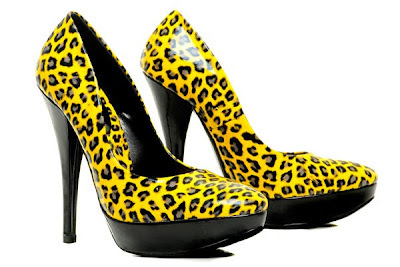 The heels I've found below offer the silhouette in a variety of prints and designs, most notably, the animal print which is huge for this fall season. 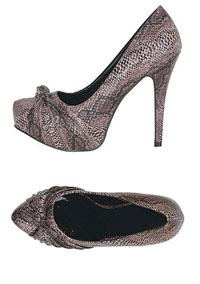 I'm loving the platform on this pump and the combo of suede and animal print. Oh here's a print that's definitely on trend. Loves the blood red color! These heels can still be accepted at the office if you're looking to spice up your work attire. The above pumps may be daring but I think they're worth it. 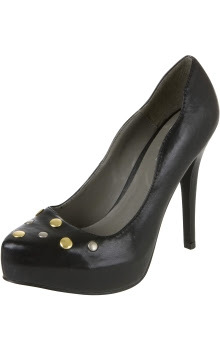 Love the studs on these pumps....and the awesome price! The leopard pumps and blue studded pumps are so cute! I've got to get them.